East Burke, Vermont is home to the original Roll A Fat One T Shirt. These days on Kingdom Trails you see your share of people rollin’ fatties all over the place. They roll fat ones on Darling Hill, or heaven’s bench, or in front of Mike’s Tiki Bar. 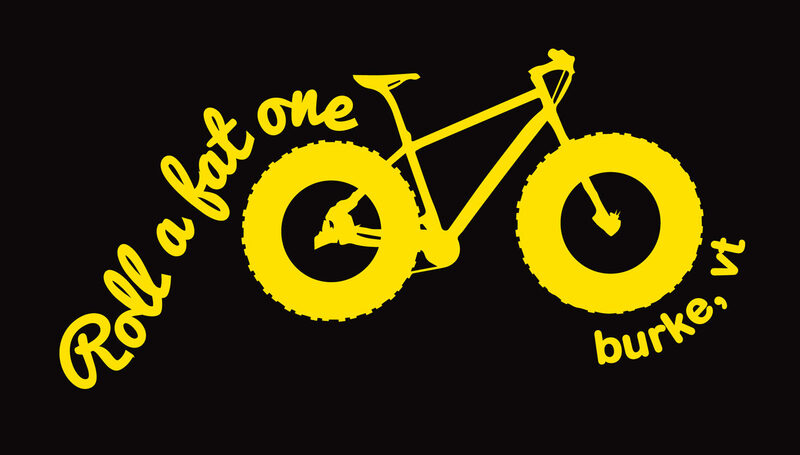 Let’s face it, fat bikes are fun, and so is our stuff. Let’s go way back here to 2014 when Roll a Fat One was born. As the legend goes David and Cathy Dwyer were watching a fleet fat bikers go by there window (that happens more than you might think when you are a Kingdom Trails landowner). Shortly after, with the help of their daughter, Molly, they put together a website, came up with a design (what we call the classic) and started selling shirts. The initial response was very positive and before they knew it they were selling them across the country. Fast forward to 2018 and that’s where we come in (Amy and Jeff Hale). It happened one night at a friend’s Kentucky derby party. While sitting down having dinner together Cathy asked Jeff if we would be interested in buying the business and keeping Roll a Fat One alive. We said, you bet, sounds like fun. It seemed like a perfect fit to us to a lot of reasons. We have lived in East Burke for over 20 years. During those years we have spent a lot of time on Kingdom Trails. Today Jeff runs JE Hale Construction. But, back in the day he worked at East Burke Sports and was involved with Kingdom Trails in the very beginning. Not to mention that he LOVES to ride his bike(s) and his Fatback is on that list. For me (Amy) it seemed like a no brainer. I’m a graphic designer/web developer by trade at Flek Inc. in St Johnsbury. This was a great opportunity to practice what I preach, have the creative license to create new designs and have some fun along the way. We have high hopes for our little t-shirt company. We are a t-shirt company in the Northeast Kingdom of Vermont selling smokin' hot shirts for all seasons. Offering men's, women's and unisex styles. We have slim fit and loose fit styles.